For some time now I have been trying to find the time to spend photographing race cars at the Motoplex Speedway nestled conveniently only minutes north of Vernon, B.C., in the lush, green, valley location just off Highway 97. I have always enjoyed looking at racing pictures of high performance cars and wanted to try photographing them myself, and so I thought, what is better than a short drive to a local track to photograph the cars there. I looked at their website’s race day schedules and contacted track officials to ask what would be the best race to attend. I introduced myself in an email and included a couple columns I had written as reference. The response was limited and direct with only the words, “23 July, NASCAR”. “Great!” I thought, “Of all the days that was the only one I was not available”. 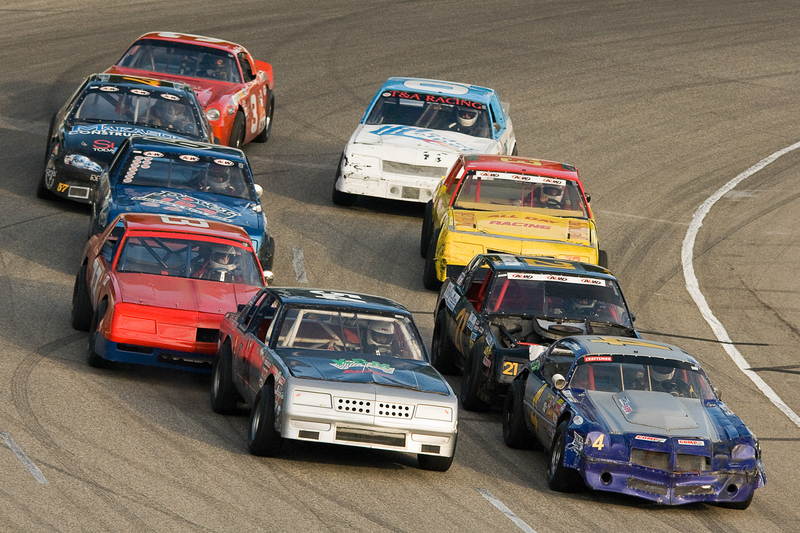 I then decided I would go to the next race advertised as the West Coast Sportsman Series, A&W Street Stocks, and Okanagan Dwarf Cars, on Sat, 13 Aug 2011. The trials began at 5pm with the actual racing at 6pm. The day had drifting clouds and by the late afternoon I knew I would have low, strong lighting, and expected there would be enough light for me to use a high shutterspeed until approximately 7pm. However, on my arrival at the gate a sign saying no cameras, no food, and no drinks confronted me. I understood the no food or drinks; like theatres, the raceway deserved their concession money, but no cameras? I was concerned and offered that I had driven all the way and had been invited. Shortly a track official arrived and after asking my name said, “He’s OK”. I paid my entrance fee and walked in. All I could discern from their comments was that the car owners’ and their sponsors’ were worried that photographers would sell pictures they took of the racecars. From then on I was given freedom to wander the spectator part of the track. Bob Newcombe, the facility manager, even took time out of his hectic schedule to personally say a few things about track safety, and then directed me to a super location for photographing the race on the roof of the main speedway building. I selected a perch that would give me a free view of the cars as they turned before the final straightaway, and could follow them from the end of the far straightaway around the curve as they all moved to the inside lane, and then vied for position after the turn. I mounted my 70-210mm on my camera. I also had my wife’s 150-500mmm and worrying about possible camera shake with that long lens, I had also brought a monopod. I quickly realized that my 70-210 was just a bit short and changed to the 150-500mm lens, zooming it between 250mm to 400mm for closer images of the action. I then attached my monopod, but had to make another change. Even though the monopod reduced the possibility of camera shake it hampered my movement, and I couldn’t angle the lens down fast enough as the cars raced towards me after the turn. I wasn’t happy about hand holding the big telephoto lens, nevertheless, I knew that the rule for handholding a telephoto lens is to select a shutterspeed that’s the same as the lenses focal length. I chose shutter priority at 1/400th and 1/500th of a second while handholding that big lens, and will admit I was surprised at the number of keepers. Photographing the race cars was all about timing, and predicting their path was easier than photographing birds; but one has to pay attention, being aware of how shutter priority would expose the cars, and selecting continuous shooting mode helped. I had intended to write this column suggesting the Motoplex Raceway as a good place for photographers, however, the result wasn’t as planned because of the “no cameras” requirement. 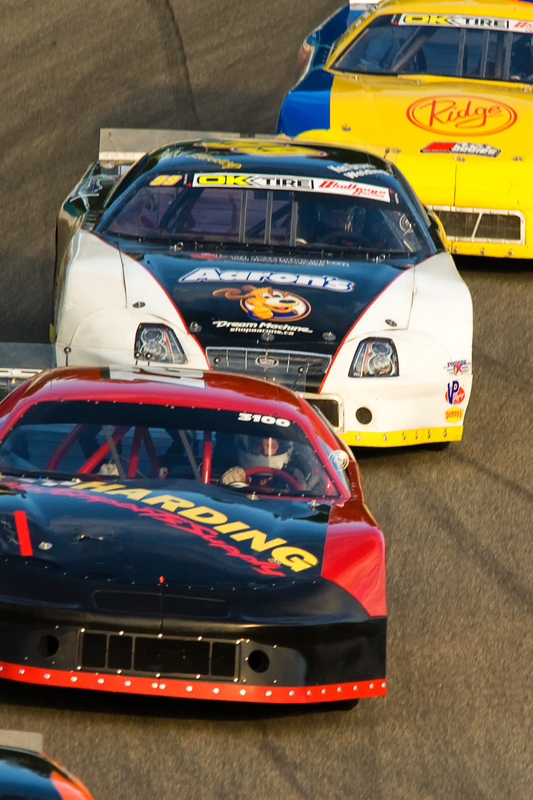 I would like to support the raceway, and I did enjoy my opportunity to photograph the racing, and would like to try again. With the no-camera rule I can’t recommend it for photographers unless one gets get special permission, however, I will say, for those that like car racing, attending without a camera would still be enjoyable. They even had an event called “King of the Hill” when anyone could race their family car on the track. 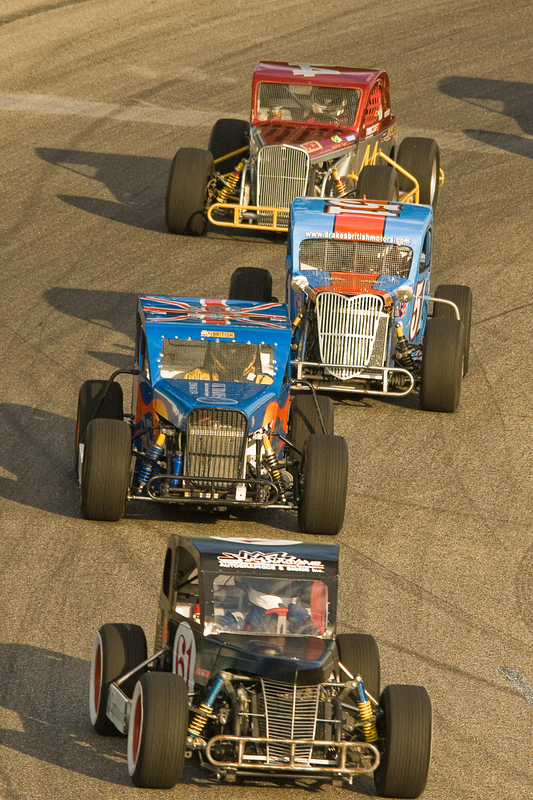 This entry was posted in Photography and tagged 150-500mm, big telephoto, hand-holding, motoplex raceways vernon, race cars. Bookmark the permalink.